The iPad has proven to be a very useful device, that enables me to do a lot of things in a very efficient way. However, I always thought that tablets were not really suited to do ‘real work’. Until I looked at some software development apps. And I have to admit that I was very impressed with the options. Some apps allow you to run your code right on the iPad. Most contain example code and references to the language APIs and tutorials. Some of them have the documentation bundled with the app for offline viewing. Editing on the iPad has its limitations. Editing without an external keyboard is hard as expected. On the other hand, the iPad offers interaction with the code or the running result that cannot be matched by a regular desktop or laptop environment. Let’s take a look at a few apps that I downloaded. Pythonista by omz:software is an IDE for Python. 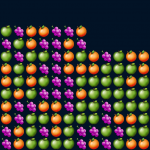 There are some example scripts, one of them a simple game that you see in the gallery below. It has an offline language reference and the official Python tutorial. You can run your scripts on the iPad. And there are some special Pythonista modules that enable you to access iOS specific functionality, like vector graphics or access to the keychain for password storage. You can also see on the screenshot of the editor, that the onscreen keyboard has been augmented with extra keys for commonly used characters in code, like the brackets and parentheses. Now this is a very useful app. Shaderific by Gryphos GmbH allows you to develop OpenGL ES2 shaders. There are some examples build in the app, but you can also develop your own. The app offers also an augmented onscreen keyboard, but also things like code completion and context sensitive help. But the best thing is that you can check the results of your shader with the build-in models. You can also import your own models, textures and shaders from DropBox. The 3D models can be rotated and zoomed like you would expect from an iPad. You can also adjust the lighting direction (only one light source). And you can animate the object in time. Now I think this app really illustrates what the iPad can do for you as software developer. It gives you a very tactile interaction with your 3D models. This is the iOS version of Coda2 by Panic. A web development IDE, which gives you FTP access to your website and allows you to edit the files. It is very well designed and super useful to perform quick maintenance on-the-go. Lisping by Felwig is an editor for Scheme and Clojure (it cannot run Clojure, but it does run the Scheme scripts). This app is unique in that it does not use a normal editor, but a touch enabled representation of the code. This makes manipulating the code really easy on the iPad. Below you see a gallery with some screenshots of the apps. Try some of them if you like. I think some of these apps will positively surprise you. Pythonista – running a Python game. Pythonista – an iPad editor for Python. 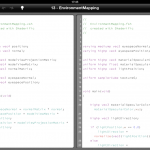 Shaderific – an iPad editor for OpenGL shaders, the code editor. 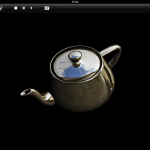 .Shaderific – an iPad editor for OpenGL shaders, the rendering of your shaders. 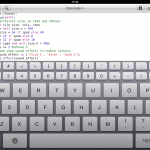 Lisping – an iPad editor for Scheme and Clojure. 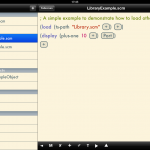 Diet Coda – an iPad web development IDE. This entry was posted in Tech stuff and tagged IDE, iPad. Bookmark the permalink.